We are realising what we are calling a “Multiplayer Alpha” of DroneGP 15 , this will help us test and improve our new multiplayer engine, while users will hopefully have a LOT of fun racing high performances drones in the alpha version tracks ! We will continue to update the alpha version with fixes and improvements so stay tuned for more info and releases ! Head to the forums to discuss about the game, about the many bugs you will find, the buggy gui, the super fun time you had etc.. While it is not required, we strongly suggest to create a FrozenPepper account within the game to submit your scores, display correct username in multiplayer and many other future features. 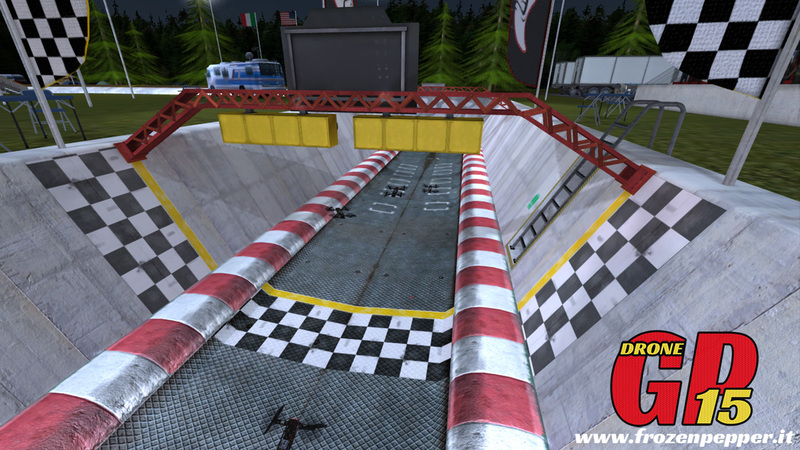 Alpha version is limited to 1 class of vehicles and 1 track. The vehicles you will be driving are in the “pro / intermediate” side, so a bit of practice is required to perform decently. GUI is rough and much will change, but it should give a great idea of where we are headed. Game supports joysticks and RC remotes, reach the settings panel from the main “Pause” menu > map input . THE GAME IS UNDER HEAVY DEVELOPMENT so expect BUGS. Use W and S keys to control height, flight controller will try to maintain height once you release height inputs. A and D keys control the vehicle yaw, basically where it points at. Up and Down arrows control the Pitch of the vehicle responsible for forward and backwards movement. Left and Right arrows control vehicle Roll , allowing you to move laterally and counter inertia in curves similarly to a motorbike. C key to change camera : 1) Third person view 2) FPV with 130° wide angle lens 3) Cinematic scenario camera, tracks first player. In Race mode, we have a height limiter on the vehicles to keep them in the track bounds (done limiting engine power of vehicle based on height ), so you might experience odd behaviours when the vertical indicator on the right side of the screen reaches the yellow leds. This happens because avionics can’t provide enough power to keep height and stability. So basically, fly low ! – New Joystick code, should allow more precision on “circular joystick” (as xbox 360). – Many improvements on Oculus integration. – Oculus optimised version, now comes with a a separate download. – A Bug was preventing quality settings selected at game launch to carry to the actual game, so basically now Quality Settings WORK. – Huge improvements in multiplayer code, new serialisation system and no more memory allocations due to networking, resulting in smoother multiplayer experience. – New scenario camera system introduction, hit “C” to cycle available cameras. – OCULUS: Fixed track map not displaying. – News system introduced to notify users of new builds and other related news. -Fixed multiplayer bug that could prevent matches from starting. NOTE : we found a bug in networking code that can prevent multiplayer matches from starting correctly… Uploading new version. Download the game > unzip it >move it to a folder of choice > double click DroneGP icon > PLAY ! Is Rc heli 3 available too on Mac or just droneGP 15 ? droneGP only, at the moment! Ist person cockpit view and more stuff like that. I bet I would be a good hit. We could call it Wipeout ? YA something like that, but with frozen pepper style of animation. Thanks for suggestions Phillip ! Might have something for you sooner or later. Hi Phillip, of course we will. This is an alpha version so it literally means we’re working on it right now, adding new stuff. While we do, you can test it, but this is far from being a final version of the game. @FrozenPepper Do you guys use your own game engine, or just strait up code? This is a really cool project, I’d love to see it completed. At the moment in the alpha I’m having trouble mapping my RC controller to the inputs. On the ‘WAILLY PPM’ control scheme it maps some of my inputs to the wrong controls, but there doesn’t seem to be any way to change what input does what, and not all the channels are being recognized. The ‘scan’ button doesn’t seem to do anything. Still, I understand this is an alpha and you’ll probably sort this out. One other thing I’d like to see in the future is some more 3-dimensional tracks, as at the moment it feels like a driving game that’s slightly above the ground. Hello ! Thanks for your feedback. Can contact us at support@frozenpepper.it , we will be more than happy to work with you in fixing the control issues. “Scan” button should sense all input changes and correctly assign joystick axis, if it’s not working for you, we have a new bug we didn’t knew of. What joystick are you using ? any news, when is beta version expected to launched it has been any awfully long time. That really sounds great :D, but the sad part is that I have an iPad 2, rc helicopter 3 is extremely laggy on it 🙁 . Are you doing anything that makes it compatible with ipad2 or is there a pic version of it 😐 . How do I get the yaw to function, I do not have the pedals to control the yaw of the drone. Hum not sure if you joystick has yaw control on main stick (turning it). If not, i would suggest to map the yaw instead of banking to main horizontal axis. At current difficulty mode in dronegp, inertia stabilisation will do a good part of the banking for you. BUT this is definitely not a perfect solution. Once you get used to it, keyboard is not too bad. Well, In fact I feel quite awkward while using the keyboard to aviation and flying games, I guess I’ll have to adjust to it. Is possible that auto yaw could be added. I play Flight Simulator 10 in my PC and have always used my joy stick to fly. The quad in this version is much tougher to control compared to R-8 Robinson helicopter. RC Plane 2 multiplayer continues to fail. Can you please fix this problem. Please report device , iOS version and bug at “support@frozenpepper.it”. Also, can you fix other huge bugs. PLUS, are you guys still working on RC Heli 2? Like are you even updating it anymore? If you are, please make the app look like the one in the store, not like it is on the home screen. Hi Sean, we are sorry but updates for Rc Heli 2 are unlikely to come, since we have released (and still working on) Rc Heli 3. A huge update for it is on the way with lots of new content. AND, are you going to add retractable landing gear? mi potete dire se posso abbinare la mia radio spektrum dx6i usando il cavo adattatore del sim phoenix e nel caso potete illustrare tutta la procedura per farla funzionare. 1) great game for practice before you get a real drone. 2) add a realistic mode after regular that adds wind that makes the flight shaky. And rain just for effect. 3) a bigger map with no height limit or a way higher map that you can fly solo or free fly with friends in an online like style. 4) add drone customizations speed, color, and body. 5) other unlock able drones. 6) more maps! Thanks all these features would be nice to see in the future! Thanks Chaos for your feedback, we truly appreciate it. Will definitely take into consideration your suggestions in next DroneGP update and in the meantime check out RC Plane 3 for more freedom in flight.